David Edward "D. J." Williams Jr (born September 10, 1988) is a former American football tight end. He was drafted by the Green Bay Packers out of University of Arkansas in the fifth round (141st pick overall) in the 2011 NFL Draft. Williams played college football for the Arkansas Razorbacks. He was long considered a competitor for the 2010 John Mackey Award which is awarded to the nation's most outstanding tight end, along with Lance Kendricks and Michael Egnew. On December 9, 2010 it was announced that DJ was the 2010 John Mackey Award recipient at the 2010 Home Depot College Football Awards Red Carpet show on ESPNU. He also won the 2010 Disney Spirit Award as college football's most inspirational player. DJ was named to the 2010 1st Team All-SEC squad by the coaches and the AP, after amassing 54 receptions for 627 yards and 4 TD for a Razorbacks team that finished 10-3 after a loss to Ohio St in the Sugar Bowl. Arkansas won the Liberty Bowl over East Carolina in his junior year of 2009, finishing with a record of 8-5. Williams was considered one of the best tight end prospects for the 2011 NFL Draft. Williams was selected in the fifth round, with the 141st overall pick, by the Green Bay Packers. 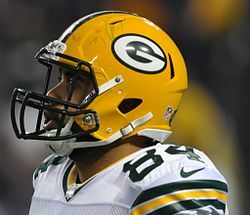 Williams was released by the Packers on August 31, 2013. Williams was claimed off waivers by the Jacksonville Jaguars on September 1, 2013. He was released by the Jaguars on November 4, 2013. On November 26, 2013, he was signed by the New England Patriots. On December 4, 2013, he was waived by the New England Patriots. Williams re-signed with the Patriots on December 9, 2013, after a season-ending injury to starting tight end Rob Gronkowski. On August 21, 2014, Williams was released by the Patriots. Williams signed with the Tampa Bay Buccaneers on November 25, 2014. He was waived on December 2. On August 16, 2015, the Washington Redskins signed Williams. On September 4, he was waived with an injury settlement for final roster cuts before the start of the regular season. Williams is a member of Pleasant Valley Church of Christ in Little Rock, Arkansas. Although like other students Williams could have cited many accolades, he chose this statement alone to appear with his picture in the yearbook: "Baptized into Christ." Williams has cited the Passion of the Christ as exemplifying the way he and his mother, Vicky Williams, and his two sisters overcame his abusive father and other challenges, including on the football field. DJ was working as a co-host on the morning show at Little Rock NBC affiliate television station KARK channel 4, when he was called by the Washington Redskins to join the team during their 2015 pre-season camp. Since he was cut before the regular season began, Williams returned to KARK. Williams has spearheaded "D.J. 's Day of Action" to build awareness and raise funds for Women & Children First, a Little Rock charity that helped Williams' family break the cycle of domestic violence when he was a child. ^ a b Harris, Hamil; Tryggestad, Erik (February 2011). "'You have to find some way to stand back up': Abuse and struggle defined D.J. Williams' childhood, but the scholar-athlete and church member endured—and lives by faith". Christian Chronicle. 68 (2). pp. 18–19. Archived from the original on December 20, 2012. Retrieved January 4, 2011. The article also describes the situation cited on the ESPN broadcast of the Sugar Bowl Game; with 58 seconds remaining in the third quarter, ESPNHD announcer Holly Rowe described how, on a night after Vickie Williams' husband beat her, Vickie Williams spread a map on the table in front of her children, and little D. J. pointed to Little Rock, Arkansas, as the place to which they should move to get away from his father. The Christian Chronicle article cites that within 24 hours D. J. 's alcohol-plagued father had been arrested for an unrelated crime. In 2011 D. J. 's father remains incarcerated for assault on a public servant, and D. J. has had no conversation with him in many years. In the Christian Chronicle article (p. 19), D. J. says: "I pray every day to be able to forgive him." ^ "Hogs' Williams finalist for Mackey Award". ESPN College Football. November 22, 2010. Retrieved January 4, 2011. ^ "D. J. Williams wins spirit award". Central Arkansas Christian. November 19, 2010. Archived from the original on July 25, 2011. Retrieved January 4, 2011. ^ "D.J. Williams, DS #1 TE, Arkansas". NFLDraftScout.com. December 19, 2010. Retrieved January 4, 2011. ^ "Packers Draft Arkansas TE D.J. Williams in Fifth Round". Green Bay Packers. April 30, 2011. Archived from the original on September 5, 2012. Retrieved April 30, 2011. ^ "Patriots re-sign TE D.J. Williams; TE Rob Gronkowski placed on injured reserve". Archived from the original on January 14, 2014. Retrieved December 9, 2013. ^ Alper, Josh (November 25, 2014). "Buccaneers add two tight ends". NBCSports.com. Retrieved August 15, 2015. ^ Smith, Scott (December 2, 2014). "Bucs Bring Rookie Patton Back". Buccaneers.com. Retrieved August 15, 2015. ^ Walker, Andrew (August 16, 2015). "Redskins Sign Tight Ends D.J. Williams And Ernst Brun". Redskins.com. Retrieved August 15, 2015. ^ Jones, Mike (September 4, 2015). "Redskins begin making final roster cuts". WashingtonPost.com. Retrieved September 5, 2015. ^ "D.J. Williams Stats". ESPN Internet Ventures. Retrieved January 13, 2014.